It's going to get mighty cold here in the Midwest in the next couple of days, in fact, it's going to be below zero. This is definitely frostbite weather (see my post on 10/12/2012 for more on frostbite). Did you know that there is a disease that mimics frostbite, but isn't frostbite at all? It's called chilblains (or pernio in medical speak). Ever heard of it? The word chilblain was coined in 1540 from chill + blain (a blister, blotch, or sore on the skin). With exposure to cold, damp weather and then sudden warming, the patient develops itching, red patches, swelling and blistering of the skin on the toes, fingers, ears and nose. You can see how this could be confused with frostbite. Unlike frostbite which is caused by actual freezing of the tissue, chilblains is caused by inflammation of the small blood vessels of the skin. But what is it about cold exposure that causes inflammation to form around the skin's small blood vessels? There's a really cool letter from 1947 in the archives of BBC Radio (see reference below) where Dr. Charles Hill says "doctors don't yet know anything to speak of about chilblains." Now, here's the interesting bit: We didn't know the answer in the nineteenth century or the twentieth century and we still don't know today! Take a raw onion, cut it in half and then rub vigorously onto the tortured toe and then sit back till the throbbing abates"
Today, chilblains are treated with topical steroids for the itching and swelling and medications that improve blood flow. 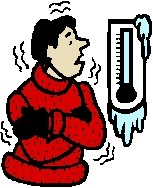 Prevention is key: Limit exposure to cold, dress warmly and cover exposed skin.